If I make these on Sunday, then I keep the leftovers in the fridge and I have breakfast for Monday (and even Tuesday, too). This makes for a quick nutritious breakfast on a school day. 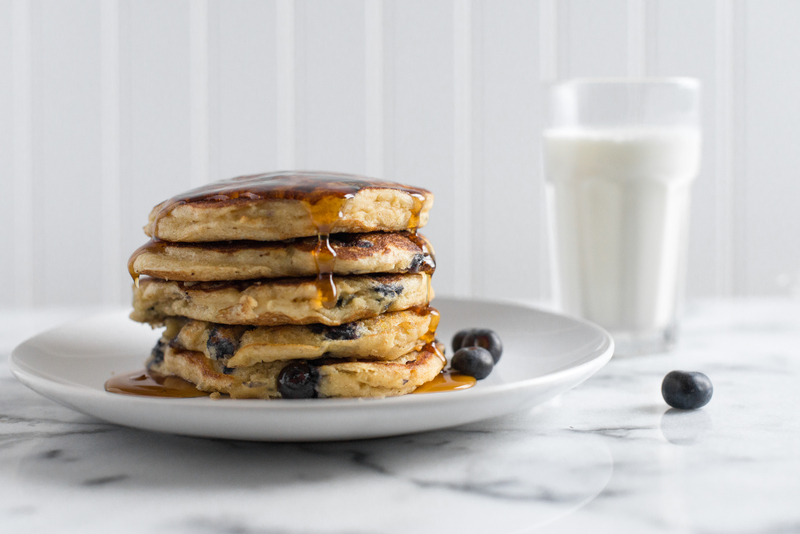 Mix pancake ingredients in an airtight container and store in the fridge for multiple uses. Heat skillet or griddle to 350 degrees with thin layer of oil. Measure pancake mix into a large bowl. Set up a medium-sized bowl and small microwave safe bowl. In the small bowl melt butter until warm, not hot. Separate eggs, placing whites in the medium bowl and yolks in the small bowl with warm butter. Mix egg yolks and butter together well. Put buttermilk (or milk and yogurt) into medium bowl with whites and whisk. Place yolk mixture into milk mixture, whisking continuously until well blended. Put these wet ingredients into pancake mix and whisk until just blended (may still be lumpy). Ladle pancake mixture onto hot grill and place mix-ins on top. Flip over when edges start to bubble and bottom is golden brown. Cook the other side an additional 2-3 minutes until set. Serve warm with favorite topping or fruit. For a healthy high-calorie version grind a cup of walnuts and fold into the batter. After pouring batter top with slice bananas. Let the banana brown slightly after the pancake is flipped. No need for syrup as this is super sweet and yummy as is! Babies who are ready for finger foods will enjoy little bits of soft pancake. Skip the syrup and instead fold in bits of fruit like bananas which will get warm and soft when the pancakes are cooked.